Approximately 1056 SF permitted upstairs plus approximately 600 sq ft enclosed downstairs without permits. Metal Roof/catchment system/water tank installed. SSPP has been paid. 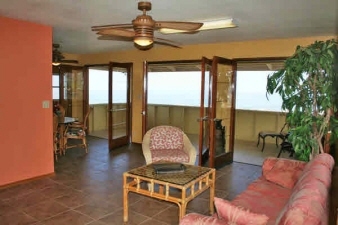 - Three double French doors opening out to ocean view lanai for your year around sunset views. - Lanai faces north/and seaward for cool breezes. - Remote control tropical fans/light combos throughout home. - Downstairs suite with his and her vanities, Jacuzzi tub, romantic triple French doors, and private entrance. Exterior Features Top notch ocean views in 2 story post and pier island home. Additional Features and Amenities 3/1 upstairs with additional large master bedroom/bath/laundry area downstairs. Option to purchase additional lot next door (TMK 3-8-8-8-14) with 5-8-8-8-13 for a purchase price of $300,000!